Jumbo Flowered Fuchsias are a must for every summer flowering display! These 4 varieties have been selected for their summer long performance and beautiful colours. With layer upon layer of delicate petals they are breathtakingly beautiful. If you have grown fuchsia before and liked them, you will certainly love these ones. Like many things in America, it seems the bigger, bolder and brassier the better! And the same is true of Jumbo Flowered American Fuchsias - a must for every summer flowering display! 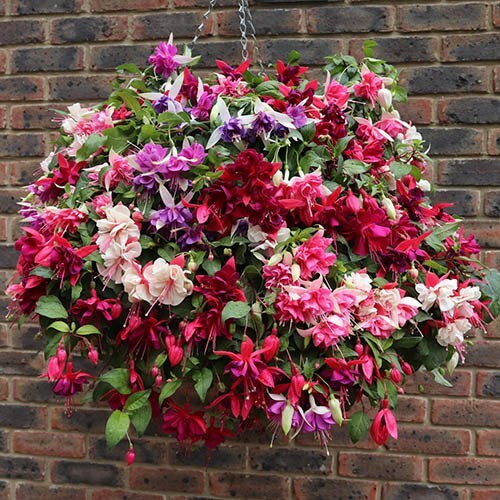 So many keen gardeners consider any hanging basket incomplete without at least some fuchsias, so if you have grown fuchsia before and liked them, you will certainly love these giants too. With layer upon layer of delicate petals they are breathtakingly beautiful and always draw admiring glances. A regular best-seller with our customers, they simply perform year in year out, whatever our summer weather throws at us. These 4 varieties have been selected for their huge flower size and summer long performance and beautiful colour combinations. They always look best when planted up where they can trail and you can look up in to the blooms, as they cascade over the side of baskets. Follow the crowd, and see why Jumbo Flowered American Fuchsias are lighting up British gardens too! Supplied as 12 Jumbo Plug Plants (2.5 - 3.5cm diameter) 3 each of 4 varieties shown. Not frost hardy so keep protected until the last frost.